Alhamdulillah, this will be the 6th year we are supporting Guidance Excel to provide this Hajj Badal service. Before Hajj Badal is explained, let's understand Hajj. 4) To have sufficient provisions for dependents for the duration of absence; to possess all requirements of travel and financially be able to afford the journey and its expenses. 5) Security of route. Ensure the journey is safe. 6) A woman must be accompanied by her husband or a Mahram (a male member of her family whom she cannot marry according to Islamic Law). If any of the above conditions are not found, Hajj will not be considered Fardh. Hence, there is absolutely no need to take loans, nor is there any need for the 'Fly Now, pay later' scheme. It should be borne in mind that Hajj is not Fardh upon a blind person; a person who is unable to walk; and upon an invalid person. When the conditions that make Hajj Fardh are found, then it becomes Waajib upon that person to perform Hajj immediately (during the first available Hajj period). One is not permitted to delay the Hajj, one will be committing a very grave sin and in the eyes of the Shari'ah one will be classified as a Faasiq (disobedient to Allah the Ta'ala). Rasulullah (Sallallaahu Alayhi Wasallam) said; 'Hasten in performing the (Fardh) Hajj, for verily one never knows what will befall one'. Rasulullah (Sallallaahu Alayhi Wasallam) said; 'The one who intends performing Hajj, then verily he must hasten'. So what happens when one whom have set intentions for Hajj and had met all the requirements above passed on or fell critically ill before he/she could take on the journey? Narrated by 'Abdullah bin Abbas Al-Fadl (his brother) was riding behind Allah's Apostle and a woman from the tribe of Khath'am came and Al-Fadl started looking at her and she started looking at him. The Prophet turned Al-Fadl's face to the other side. The woman said, "O Allah's Apostle! The obligation of Hajj enjoined by Allah on His devotees has become due on my father and he is old and weak, and he cannot sit firm on the Mount; may I perform Hajj on his behalf?" The Prophet replied, "Yes, you may." That happened during the Hajj-al-Wida (of the Prophet). Hajj Badal is the term use for performing Hajj on behalf of others. To do so one must meet the requirements for Hajj Badal. 1) This person must have passed away or is very sick (have no hope for surviving). 2) If best it must come from the wealth of the deceased that was left behind. 3) The family must have the financial means to do so after paying all the debts of the deceased. 4) The cost of Hajj Badal cannot be more than 1/3 the cost of an actual person going for Hajj. 5) The performer that performs this on behalf of the deceased must have gone for Hajj before. What if all the wealth left behind was just enough to pay the debts he owed to others and nothing left behind? Then this is not compulsory for the family to perform Hajj Badal as it does not meet the requirement above. What if the family members still insists on doing so for them as they pool the money for this? May Allah swt reward them for this effort but please take note it is still not compulsory to do Hajj Badal for this deceased person because of the requirements not met. Do not put burden onto yourself nor your family if you don't have the financial means. Allah knows best. Hajj Badal is only for one whom had wealth and was not able to perform the Hajj during his/her lifetime. If you have fulfilled the criteria above, we offer the following packages. 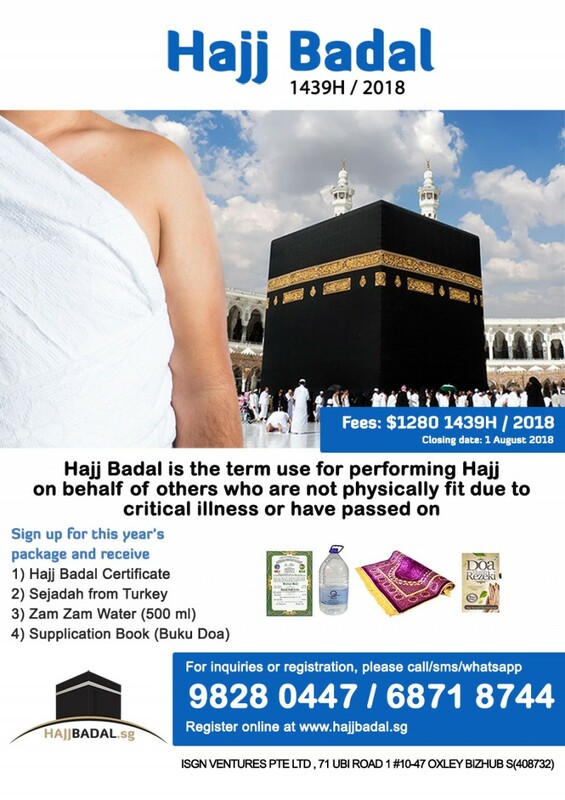 Who will perform the Hajj Badal for you? Islamicevents.sg is working with various agencies in Singapore and Malaysia to organise this activity. They will engage University Students from Medina/Mecca and also Hajj travellers to perform the Hajj Badal on your behalf. Each package will be assigned and will be sponsoring one student from Medina or Mecca or hajj traveler for Hajj. * Please take note that all the items will be delivered latest by December 2018. Why does it take so long for the items to arrive in Singapore? Firstly, after the Hajj and the 3 tashrik days, the organisers will still be staying in Mecca for 30 days. Then they will take another 15-30 days to prepare the items above to be transported over to Singapore. Once it reached Singapore, we will prepare the certificates and have to sort the orders out before items are despatched to your home. Insha Allah, once the items are ready to be delivered, you will be notified on the delivery date and time. b) By Home Collection (Cash) - we can arrange a despatcher to collect at your home. c) By Nets or Cash @ Office, 71 Ubi Road 1 #10-47 Oxley Bizhub S(408732). Please make appointment via WhatsApp to 98280447 (Khai). Fill in the form and make payment online below.